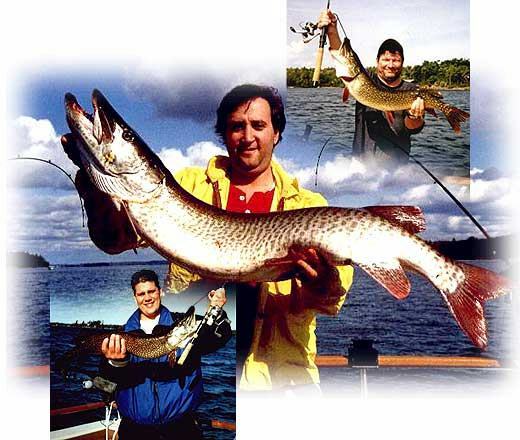 Now in our 42nd year of catering to anglers from across the country and around the world, 1000 Islands Fishing Charters is widely recognized as the most experienced and innovative sport fishing charter service on the St. Lawrence River. It's no wonder that in 2019, for the 27th straight year, we are one of only 14 charter services in N.Y. State and the only one in the 1000 Islands Region approved by the North American Fishing Club, the largest sport fishing organization in the world, serving more than 500,000 angler members. for fishing trips between opening day on May 5th and Friday, June 15th. If your group is larger than six anglers, no problem. Groups up to 12 welcome. Your boat, A.B. 'S Office, is the Only U.S.C.G. Certified charter fishing boat on the St. Lawrence River, Certified by the Coast Guard to legally carry more than the traditional 6 passengers that all the other fishing charter boats are restricted to. "Unless you're the lead dog, the scenery never changes!" We provide free, secure off street parking at our convenient departure location in the heart of downtown Clayton. just $65 per person. (Before July 1st and after Labor Day please reference our Private Charters, below). special treatment of a traditional 1000 Islands Guided Fishing Trip as the center of your guide's attention. Your boat, our U.S.C.G. Certified charter boat. The largest, safest and only one of its kind in the 1000 Islands. Here's what U.S.C.G. Certified means to you. Don't be misled by the term "c. g. inspected." Information that may be helpful in planning your fishing trip. We encourage our anglers to read this section in our mutual interests. On-board Lunch: Fish the entire day enjoying your hearty sandwich or cold fried chicken lunch on board at your convenience. Island Picnic Cook-out: This has become our most popular on-shore lunch option since we introduced it. After fishing all morning, finish your 6 hour charter trip or take a break in your full day charter and enjoy a traditional 1000 Islander's picnic cook-out lunch, prepared on an island, by your guide. 1000 Islands Shore Dinner style="font-weight: bold; font-style: italic;" href="shoredin.htm">: Available only on full day private charters, the tradition of a shore dinner goes back to the earliest days of the 1900's. As we describe, this is a "made from scratch" event. No canned or pre-prepared foods here. You fish until around noon and the rest of the day is taken up by the preparation and enjoyment of this historical tradition. Hot on-board lunches for fall 6 hr. & full day Muskie trips: A special treat for muskie anglers, especially on chilly fall days. Our many offerings and their reasonable prices make them popular special occasion gifts for family and friends. Why you should never take bananas on a fishing boat, how fishing may help you live longer and a couple great fishing tales. Enjoy the current edition of our popular on line newsletter. Click your browser's BACK button to return. Also available is a copy of the DVD of the TV special at a 50% discount, all delivered right to your home in 2 to 3 business days by priority shipping. to check on availability for your 1000 Islands fishing trip. the Bass season opens in both New York & Ontario on June 15th. convenience stores and three major bank branches where anglers can access cash for payment of their fishing trip.